"I found myself in Italy the way I find myself in most places: by chance." I’m not sure what I’m more in love with: Gianluca & Georgie, or Vernazza, Italy. "He was romantic looking, the sort of man who breathes passion into life without even trying." Georgie is a character—her jest is as infectious as her love for croissants and espresso. Gianluca is broody and emotionally unattainable, something that Georgie can only see as a challenge. She thrives on living life as vibrantly as possible and seeing Gianluca doing quite the opposite throws her off. "He wasn't meant to be my forever, but forever was a long way away." Without giving any of the plot away, Georgie and Gianluca find themselves drawn to each other for different reasons. Georgie is looking for love in a place that boasts romance; Gianluca is looking for fun and Georgie is quite literally fun personified. She can handle being the cool girl if that means she can have Gianluca. "You can't just move to Italy to escape your problems and assume they'll work themselves out. Eternal optimism will only carry you so far." 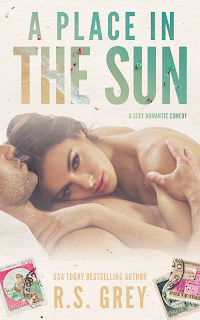 I was thinking over why I loved the name of this book so much and it hit me after finishing the story—reading A PLACE IN THE SUN was like living underneath the heat of the sun, both scorching in its intensity and slow burning like only the best love stories are. R.S. Grey’s writing will do that to you: transport you to a place that is equal parts real and a dream. This book was a dream—the kind you don’t want to wake up from. Nice post , Thanks you for sharing . .. . Thanks for review from your experience. It's a very good book, I love watching your good writing.